Sir Brian Souter (born 5 May 1954) is a Scottish businessman and philanthropist. With his sister, Ann Gloag, he founded the Stagecoach Group of bus and rail operators. He also founded the bus and coach operator Megabus, the train operating company South West Trains, his investments company Souter Holdings Ltd and the Souter Charitable Trust. Souter has also been politically active in Scotland, and supports the Scottish National Party financially. In 2000, when the Scottish Executive proposed to repeal Section 2A of the Local Government Act, which prevented local authorities from "promoting homosexuality", Souter started the Keep the Clause campaign to oppose their plans, spending one million pounds of his own money to organise a private referendum across Scotland. This campaign and other controversial statements have led opponents to accuse him of homophobia. In 2011 he was awarded a knighthood for services to transport and the voluntary sector. The honour was criticised by Scottish Labour Party politicians and by gay rights campaigners. Souter was born in the Scottish city of Perth. His father was a bus driver and as a child Brian often travelled on bus routes with his father. At school he developed an interest in economics and accounts, about which he later said, "Changing my timetable from maths to include economics and accounts was one of the best things I’ve ever done." On leaving school, he studied at the Abertay University to become a commerce teacher. On completion he studied at Strathclyde University in Glasgow, where he graduated with a CA Diploma in Accountancy and Economics. Following his graduation Souter became a Chartered Accountant at Arthur Andersen & Co. Using his father's redundancy money, with his sister Ann Gloag and his brother-in-law Robin Gloag he established the Stagecoach Group in 1980, running buses from Dundee to London. Expansion continued, and in the late 1980's Stagecoach acquired National Bus Company subsidiaries in Cumberland and Hampshire, and the East Midlands, Ribble, Southdown and United Counties companies. 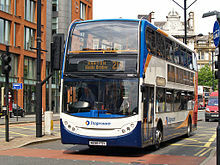 Stagecoach also bought bus operations in Scotland, Newcastle and London, with Manchester being added a few years later. In 1993, Stagecoach was valued at £134 million and was floated on the London Stock Exchange to access capital for new opportunities for buses and trains overseas. By the mid 1990s, Stagecoach developed its interests in Australia and New Zealand. The company further expanded with the purchase of Citybus, an operator of buses and ferries in Hong Kong, and Coach USA, the largest bus and coach operator in the USA and Canada. [dubious – discuss] Souter became Chief Executive, and later sold off much of Coach USA. Following the deregulation of bus services in the United Kingdom, Stagecoach bought a number of the new small bus companies and ran free or low fare buses to put local rivals out of business. In Darlington, Stagecoach subsidiary Busways offered bounties to recruit drivers from the existing bus service and offered free buses to deter the rival preferred bidder from taking over that service. This practice was deemed as "predatory, deplorable and against the public interest" according to the Monopolies and Mergers Commission. In 2009, Souter received a £1.6m bonus. Stating "it was felt that in the present economic climate it would not be right for any individual to pocket a bonus package of £1.6million", he donated £900,000 to his own charity, the Souter Charitable Trust, which assists humanitarian projects in the UK and overseas. Most of the remainder was given to the staff pension fund. In August 2012, it was announced that Souter would become Chairman of Stagecoach Group on 1 May 2013, finance director Martin Griffiths replacing Souter as CEO. Shortly after Souter floated Stagecoach on the London Stock Exchange, he turned his attention to British railways. Initial experiments consisted of a Scotland to London service branded Stagecoach Rail with carriages attached to the Caledonian Sleeper. During the privatisation of British Rail, Stagecoach bid successfully to operate the South West Trains franchise from 1996 followed by the Island Line Trains later the same year. Stagecoach successfully bid to retain both when retendered in 2001 and 2006, before they passed to South Western Railway in 2017. In 1998, Stagecoach purchased a 49% shareholding in Virgin Rail Group that operated the CrossCountry and West Coast franchises. 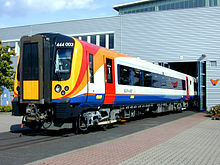 In 2007, Stagecoach commenced operating the East Midlands Trains franchise. From April 2015 until June 2018, Virgin Trains East Coast in which Stagecoach held a 90% share commenced operating the InterCity East Coast franchise. In 2003, Souter added the bus and coach operator Megabus to the group. With its slogan "Low Cost Inter City Travel Serving Europe", it offered discounted travel across the UK and Europe. In 2012 it operated in 31 cities in the UK with a turnover in excess of £2 billion, with annual profits of over £250 million. In April 2013 Souter announced a new Megabus overnight sleeper service from Scotland to London. The sleeper coaches cost £5 million to build, and have 53 leather seats which can be converted into 42 bunk beds. Passengers receive a onesie for sleeping in during the trip. This service ended in May 2017, due to it being consistently loss-making, and the coaches are now only used on daytime services. Souter has more than 200 private investments, which are managed by his company, Souter Investments. They include stakes in insurance specialists esure and Gocompare.com. In October 2010, Souter Investments reported that the value of its portfolio had risen by 41% over the preceding three years, to £400 million. Highland Global Transport has purchased and established a number of subsidiaries in New Zealand. In August 2015, these were brought together under the one umbrella as the InMotion Group with 340 buses and coaches and 17 ferries. ManaBus and Naked Bus ceased operation on 15 July 2018, with the bus fleets being sold to Ritchies Transport. In April 2015, Souter was officially appointed Vice President of the Institute of Chartered Accountants of Scotland, alongside newly appointed President, Jim Pettigrew. Souter, who qualified as a Chartered Accountant in 1984, was the sole nominee for the vice-president role. It puts him in line to become president in two years’ time. In 2000, the Scottish Executive proposed the abolition of Section 28 laws, which forbade local authorities from "intentionally promoting homosexuality". Souter was a prominent leader of the Keep the Clause campaign, which sought to prevent its abolition. In Scotland, where Section 28 was known as clause 2A, Souter spent £1 million on the first privately funded postal referendum across Scotland to gauge public opinion. A spokesman for Souter stated "He is not in this for personal glory. He is fighting this battle because he is a father and committed Christian." 3,970,712 ballot papers were posted out and 31.8% valid votes were returned, a turn out rate lower than any Scottish national election. 86.8% were in favour of keeping Clause 28, 13.2% in favour of repeal. Souter pointed out that the number of people who voted to keep the clause exceeded the number of votes cast for any single political party in Scotland at any election over the preceding ten years, although Scottish voters usually choose from four main parties, not two options. The campaign was ultimately unsuccessful. Souter's campaign group approached the Electoral Reform Society to organise the ballot through its ballot services subsidiary. The society refused the request as it believed the poll "would not be a legitimate democratic exercise to ask people to give an opinion on the repeal of Section 28 without knowing the detail of what would replace it". Many groups hostile to Souter's stance had called for a public boycott of the poll, and accordingly claimed that as only a minority voted this was a defeat for Souter and his supporters. Mainstream politicians, including the Scottish National Party (which Souter has supported) largely ignored his poll and disputed whether the result was a true reflection of public opinion, with the Scottish Executive stating that the public had been fed a diet of "misinformation and lies" by Souter's campaign group. The Communities Minister, Wendy Alexander MSP, criticised the poll, stating "I think what is significant about today's ballot is that two out of three voters rejected, or binned or simply ignored this glorified opinion poll." Gay rights campaigner Peter Tatchell stated that "Brian Souter’s support for Section 28 is the moral equivalent of the business-funded campaign to maintain racial segregation in the Deep South of the USA in the 1950s." Tatchell said that Souter's campaign was "hateful" and that it is clear that he was using his vast fortune to try to keep a cruel and "bigoted law" intact. Souter was a major financial supporter of the Scottish National Party (SNP). In March 2007, he donated £500,000, citing an imbalance of funding within Scottish politics. He stated that it was his intention to redress an imbalance in funding: "as long as I can remember, the case for the union has been hugely financed by cash from London, while the case for independence has lacked resources. I hope my donation will help redress this imbalance". Following the donation, SNP leader Alex Salmond was criticised for "pandering to homophobia" by accepting the donation. Salmond thanked Souter for his support, calling him "one of the outstanding entrepreneurs of his generation". One month later, in April 2007, the SNP's commitment (made at the party's 2006 conference) to re-regulate the bus network was dropped from the 2007 manifesto, although the SNP denied any direct link. In February 2011 Souter again pledged financial support for the SNP, promising to match every pound they raised with a donation of up to £500,000. Announcing his support he said Salmond and the SNP deserved a second term in office. The SNP won a resounding victory in the election with Salmond being returned unopposed as First Minister. The BBC reported in August 2014 that Souter had donated £1 million to the campaign for independence. In 1992 Souter and his wife set up the Souter Charitable Trust, which assists humanitarian projects in the UK and overseas, especially, but not exclusively, those with a Christian emphasis. Projects include the prevention of malaria and supplying daily meals to school children in Africa. According to its website, the trust has awarded over 2,700 grants worth more than £20 million. Groups funded annually by the trust include Tearfund, The Message Trust, Oasis Trust and Jam International. In 1989 Souter received an award from the Scottish Business Achievement Award Trust. In 1997 he was granted an honorary degree from Strathclyde University. In 1998 he was awarded the Scottish Entrepreneur Award. In 1999 he received his second honorary degree, from Abertay University. In 2004 he was honoured with the Businessman of the Year award at the Insider Elite Awards. In 2008 he was given a Special Recognition Award for services to the bus industry. In June 2010 he was given a Special Career Service Award at the "Talent In Mobility" Awards, part of the European Mobility Exhibition held in Paris for the public transport industry. In October 2010 he was awarded the Ernst & Young UK Master Entrepreneur of the Year. In 2011 he was presented with an outstanding achievement award at the 2011 Perthshire Chamber of Commerce Business Star Awards. On 18 April 2012 he was inducted into the British Travel and Hospitality Industry Hall of Fame, the first public transport entrepreneur to receive the honour. Souter was knighted in the 2011 Birthday Honours for services to transport and the voluntary sector. This proved controversial, and was criticised by Scottish Labour MP Cathy Jamieson, who suggested a link between the knighthood and the large amounts of money he has donated to the Scottish National Party. In a public statement, Jamieson said: "The First Minister and his party must look seriously at the relationship they have developed with wealthy individuals handing them large sums of cash. The public will rightly be asking what’s next on Mr Souter’s shopping list?" Salmond denied any wrongdoing in the matter and referred himself for investigation after calls for a probe by Scottish MP Jim Sheridan. An independent report, conducted by Lord Fraser of Carmyllie, cleared Salmond of any wrongdoing, asserting that "There appears to me to have been no breach of the ministerial code by Alex Salmond as First Minister and he should be wholly exonerated of any breach." Souter's knighthood was also criticised by gay rights campaigners, who felt that the honour was insulting towards the gay community and was effectively rewarding homophobia, given Souter's past campaigning. A petition to have the knighthood withdrawn received 5000 signatures by July 2011. In 1998, Souter described English Northerners (who make up a considerable proportion of his customers) as "the beer-drinking, chip-eating, council house-dwelling, old Labour-voting masses." Souter lives in Perth, Scotland with his wife and four children. He is a member of the Church of the Nazarene, and attends Trinity Church of the Nazarene in Perth. In April 2014 he was included in the 2013 Sunday Times Rich List as the 118th richest person in Britain, with a fortune of £1.04 billion. ^ a b "Sunday Times Rich List". The Sunday Times (page 33). 26 April 2014. ^ "Brian Souter knighted in Queen's birthday honours". BBC News. 11 June 2011. Retrieved 5 February 2012. ^ "Childhood". Briansouter.com. Retrieved 25 October 2013. ^ "Abertay University, Dundee - A-Z Unis & Colleges - Getting Into University". London: The Independent. 1 May 2011. Retrieved 5 February 2012. ^ a b c "Brian Souter: Stagecoach's straightman". BBC News. 21 January 2000. Retrieved 5 February 2012. ^ "Bus History | Magicbus | National Bus". Brian Souter. Retrieved 5 February 2012. ^ "Stagecoach pays pounds 1.21bn for largest US bus operator". The Independent. London. 15 June 1999. Retrieved 28 October 2013. ^ Glenda Cooper (24 December 1995). "Stagecoach set record of shame ful record of shame - Home News - UK". London: The Independent. Retrieved 5 February 2012. ^ "The supply of bus services in the north-east of England". Competition Commission. Archived from the original on 4 February 2012. Retrieved 5 February 2012. ^ "Stagecoach boss gives his £1.6m bonus to staff and charity". The Daily Record. Retrieved 5 February 2012. ^ "Faith in Community Scotland". Faith in Community Scotland. Retrieved 5 February 2012. ^ "Stagecoach CEO Brian Souter to become chairman next year". Reuters.com. 22 August 2012. Retrieved 22 August 2012. ^ "Stagecoach entrepreneur Brian Souter still as driven as ever". The Courier (Dundee). Archived from the original on 4 March 2016. Retrieved 28 October 2013. ^ "Annual Report and Financial Statements 2012" (PDF). Stagecoach Group. Retrieved 28 October 2013. ^ "Stagecoach chairman Sir Brian Souter shows the way to Onesie Day". Daily Record. 29 April 2013. Retrieved 7 November 2013. ^ "Megabus is axing their luxury coach service". 9 April 2017. Retrieved 20 November 2017. ^ "Souter Investments". Web-markets.net. Archived from the original on 29 October 2013. Retrieved 25 October 2013. ^ Venuto, Damien (21 June 2018). "Fifty jobs on the line as ManaBus and Nakedbus end services". The New Zealand Herald. Retrieved 23 June 2018. ^ Huband, Graham (25 April 2015). "Jim Pettigrew and Sir Brian Souter lead major Scottish accountancy body Icas". The Courier. Archived from the original on 27 April 2015. ^ a b c "SCOTLAND | Poll supports S28 retention". BBC News. 30 May 2000. Retrieved 5 February 2012. ^ "SCOTLAND | Souter poll hits major setback". BBC News. 31 March 2000. Retrieved 5 February 2012. ^ "Keep the Clause: the legacy - News - Scotsman.com". Scotlandonsunday.scotsman.com. 6 March 2005. Archived from the original on 13 March 2005. Retrieved 5 February 2012. ^ "Think Again, Brian Souter". Peter Tatchell. 16 January 2000. Archived from the original on 9 August 2011. Retrieved 5 February 2012. ^ "UK | Scotland | Stagecoach tycoon donates to SNP". BBC News. 17 March 2007. Retrieved 5 February 2012. ^ a b c Paul Hutcheon (17 March 2007). "Souter jumps back on SNP bandwagon with £1/2 m donation". Herald Scotland. Retrieved 5 February 2012. ^ "SNP under attack after bus U-turn - Edinburgh, East & Fife - Scotsman.com". Business.scotsman.com. 23 April 2007. Retrieved 5 February 2012. ^ "£500,000 war chest for Alex Salmond - News". Scotsman.com. 12 February 2011. Retrieved 5 February 2012. ^ "Brian Souter Announces His Donation To The SNP". Briansouter.com. 13 February 2011. Retrieved 5 February 2012. ^ Black, Andrew (18 May 2011). "BBC News - SNP leader Alex Salmond re-elected as first minister". bbc.co.uk. Retrieved 5 February 2012. ^ "BBC News - Scottish independence: Sir Brian Souter donates £1m to SNP". BBC News. Retrieved 3 November 2014. ^ "Souter Charitable Trust: Grant Guidelines". Souter Charitable Trust. Retrieved 25 October 2013. ^ "Brian Souter | Souter Charitable Trust | About". Souter Charitable Trust. Retrieved 5 February 2012. ^ "Souter Charitable Trust: Projects". Souter Charitable Trust. Retrieved 25 October 2013. ^ "Biographies — The Entrepreneurial Exchange". Entrepreneurial-exchange.co.uk. Retrieved 28 October 2013. ^ "Glasgow Business Club". Glasgow Business Club. 23 February 2012. Retrieved 28 October 2013. ^ "CRIEFF News Archive". Crieff.wordpress.com. Retrieved 28 October 2013. ^ Custom byline text: Ben Griffiths (8 October 2004). "Baxter and Souter lauded for successful recipes". Herald Scotland. Retrieved 28 October 2013. ^ "Bus Companies Celebrates Award Success". TravelNorthEast.co.uk. 19 November 2008. Retrieved 7 November 2013. ^ "Transports Publics 2012 - 'Talent in mobility' awards". Transportspublics-expo.com. Archived from the original on 9 October 2010. Retrieved 2012-02-05. ^ "Star Awards 2011". Perthshire Chamber of Commerce. Retrieved 28 October 2013. ^ "Sir Brian Souter enters British Travel Industry Hall of Fame". stagecoach.com. 18 April 2012. Retrieved 19 April 2012. ^ a b "Queen's birthday honours list: Knights | UK news". London: The Guardian. 11 June 2011. Retrieved 5 February 2012. ^ HELEN McARDLE (7 August 2011). "Row grows over honour for Sir Brian". Herald Scotland. Retrieved 5 February 2012. ^ "Alex Salmond cleared of any wrong-doing in knighthood nomination for Stagecoach tycoon Brian Souter". The Daily Record. 28 November 2011. Retrieved 5 February 2012. ^ Dalberto, Lorenzo (5 July 2011). "Gay students oppose Brian Souter's Knighthood". deadlinenews.co.uk. Retrieved 12 November 2013. ^ From the archive (5 January 1998). "A wrong turning Stagecoach boss's comments are unwise". Herald Scotland. Retrieved 5 February 2012. ^ "Suffering from foot-in-mouth | Business | The Observer". London: Observer.guardian.co.uk. 19 October 2003. Retrieved 5 February 2012. ^ Margaret Stead. "Weblogs as a Career Tool - Career Coach Newsletter October 2003 from". Careersnet.com. Retrieved 5 February 2012. This page was last edited on 16 March 2019, at 07:59 (UTC).